1. They put the seat down – Our home isn’t a gas station or a truck stop, therefore the simple action of placing the toilet seat down after using the bathroom demonstrates love. You might not appreciate this action until you have assumed the seat was down and tragically realized it wasn’t. Splash. Early in their childhood, we made this a family rule. In addition we also flush, and close the door when using the bathroom. 2. They clean the rim – In a moment of frustration, I once wrote a frustrated message on the toilet seat in black Sharpie pen. Nothing else seemed to be working so I expressed my annoyance. This was after repeated requests for the offending party to please be more careful, I had had enough. My OS weren’t children or new to potty training, they possessed enough awareness of their bodily functions to avoid leaving yellow driblets on the seat. They were chagrined and now are usually more mindful. One day their wives can thank me for this. 3. 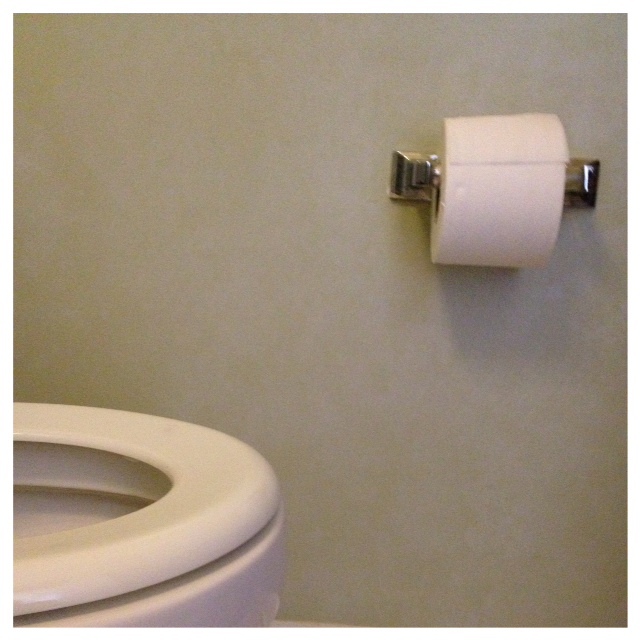 They replace the toilet paper – Another act of consideration occurs when there is a fresh roll of toilet paper on the roll. I remember once using the restroom and discovering there was only ONE THIN SQUARE of toilet paper still on the roll. When I yelled inquired why the person didn’t bother to replace the roll, I was told there was still enough toilet paper for the next person. It was a teachable moment. 4. 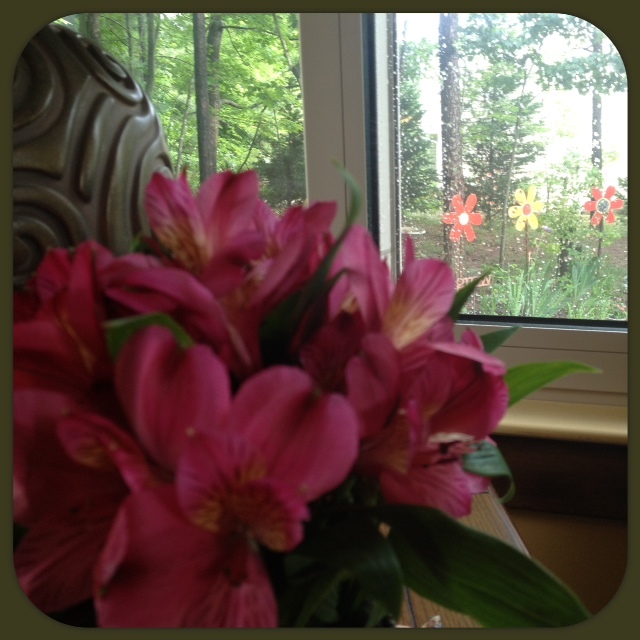 They surprise me with flowers – I don’t have to be sick or have a birthday for my boys to give me flowers. Several years ago during the summer, Aaron came home from work with a bouquet of flowers for me. He wasn’t in trouble either, it was a just-because moment. Flowers also help offset the occasional forgetful episodes outlined in 1-3. Flower inside and outside create a happy mood. Thanks, Hubs! 5. They appreciate. I feel content when my fellas notice the little touches around the house. 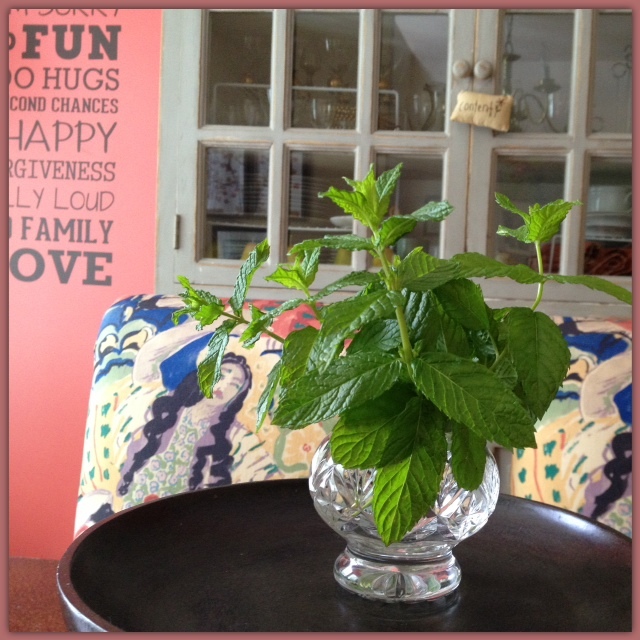 On Saturday, I cut a few sprigs of mint from our garden and placed them on the dining room table. They liked it. When I write Scripture on the kitchen chalkboard, it catches their attention or when I set the table nicely, it brings harmony. Those homey, domestic efforts aren’t necessarily observed individually but they give a welcome mood which my guys enjoy. I wonder if men understand how these small efforts at mindfulness really make a difference to a woman. It might not seem like a big deal to the Hubs or my three olive shoots but these things make me feel blessed. I like being a girl in a house full of guys. I might have to try that bit with the black sharpie. What an excellent idea. Although, in our house it doesn’t so much end up on the seat as on the walls… don’t even ask me how that happens. I had reached a level of frustration that forced me to do something that would get their attention. If we had things on the walls, I would go bonkers considering my children are 23, 18 and 16! That wouldn’t go well with them! Hope you don’t have to do the Sharpie thing! I totally identify with that toilet seat thing. If I did not teach my children (2 boys, 2 girls) one more thing, they all know to close the lid! I just feel so shocked when I go in a bathroom and see the toilet wide open, just waiting for something to fall in…! Whew! It sounds like you really understand! Thanks for the affirmation! Yes, it is not an unmanly thing to put the seat down! I really do believe it is a sign of kindness! Thanks Ronna! Arrrggghhh! Number 1 drives me mad! And it applies to other little things around the home too, where I always feel like I’m picking up after everyone, hubby included. It’s not that he doesn’t care – he genuinely doesn’t notice. Actually I guess he doesn’t see what the fuss is about either. Fumbling around in the middle of the night to put the toilet seat down is not my idea of fun… I might use a pen. Good idea! You have the right perspective. I know they don’t notice somethings and I am also oblivious to things I do so that’s where families have to extend grace and sacrificial love towards each other. Yes, falling into the potty isn’t especially pleasant, is it? My hubs is a great guy as well and it sounds like we are both blessed women! Thanks Sandy! I’ll give her credit for at least being honest about simply not wanting to do it! Yes, sometimes disgusting facts will bring home the point. I think some of this only really solidifies in their minds when they experience the same thing and then realize that Mom wasn’t so crazy after all! I am sure this is a shared experience for moms with sons. I love the sharpie, but my husband helped me with my boys. The walls and floor as well as the seat would always be a mess. One day when I was moaning about it, my husband sweetly suggested that I make bathroom cleaning their job. Brilliance! They were so grossed out by washing icky walls, floors and seat that they learned better aim. I believe they were 4 and 6 at the time. I have to give my mother in law credit – she must have taught my husband to put the seat down, because he has never left it up. Our kids always put the lid down, too, because we told them drinking from the bowl was bad for our puppy dog – it was an easy habit to get into when it was to protect someone they loved. Your ideas were better than mine! I think it’s funny that it was a puppy that got your kids to put the seat down but hey it worked and it makes sense! I do think about my sons being future husbands and putting the seat down is one mark that our boys were trained to be considerate of others and take the nanosecond to put the seat down after using the toilet. Truly it is the little things that can make a difference. Thanks for your insight, Dawn! We, 3 and 5yr old, don’t do too shabby with the ‘lid down’ thing. A few more years and hopefully it’ll be perfected. What did you write with the sharpie?! What a gorgeous site. Lovely smile – in both adult and childhood photos!